A week after Cope Reynolds, the owner of Arizona’s Southwest Shooting Authority, took out an ad in the local paper and posted a sign at his store banning Obama supporters from entering, Cope says that business is booming due to the attention his business has received from his anti-Obama promotion. Mr. Reynolds says he has had hundreds of calls and emails from news organizations and supporters as well as the occasional fire breathing liberal – and yes, even the rare death threat – but that the proof of his genius business promotion can be found in his cash register. 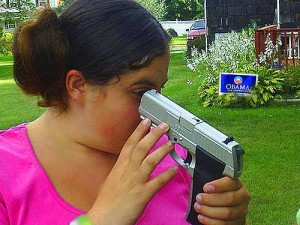 Gun store owner takes aim at low information voter.. This entry was posted on January 29, 2013 at 6:35 am and is filed under Uncategorized. You can follow any responses to this entry through the RSS 2.0 feed. You can leave a response, or trackback from your own site.